Mental Changes from B12 Deficiency are probably some of the most devastating, yet entirely overlooked problems in medicine today. And far from being ‘rare’ as the medical profession claims, these mental changes are MUCH more widespread than anyone imagines. Vitamin B12 is an underappreciated essential nutrient that most of you get far less of than you need for good health. But because you are able to store large amounts of vitamin B12 in your liver, it will often take up from 3 to 5 years after inadequate intake in order for a deficiency to actually begin to show symptoms. That is, if intake and absorption had been adequate in childhood- which in this day and age of processed foods, it often is inadequate, even in childhood when liver stores of this vitamin begin. 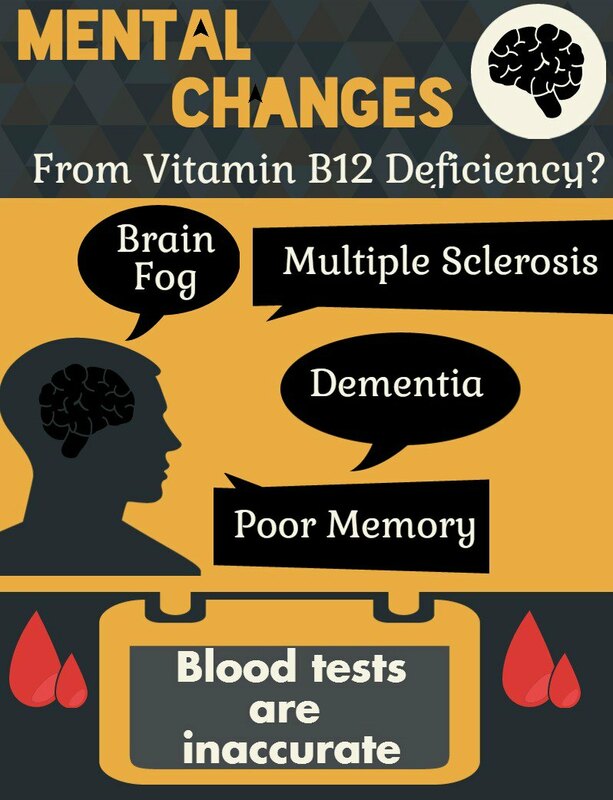 Because getting your Vitamin B12 Levels done often gives false results and because of the perception in the medical field that this deficiency is ‘rare’, these mental changes from B12 Deficiency often go unrecognized as the simple vitamin deficiencies that they are. Paresthesias- numbness, tingling and (sometimes) pain that most often occurs in the lower extremities and is sometimes labeled as Peripheral Vascular Disease (PVD) or Peripheral Neuropathy. Dementia- the early stages of what many call “Alzheimer’s Disease”. It’s when people (usually elderly) become forgetful and occasionally have odd behaviors such as wandering. Psychosis- Can encompass many aspects of mental illness. People with schizophrenia often have a ‘Psychotic Break’ and many others have hallucinations, hear voices, etc. These all fall under the category of psychosis. So, if you break this down, it means that disabling chronic disorders that MILLIONS of people suffer from that require multiple hospital visits, lifelong medication, loss of ability to function independently and sometimes even institutionalization- COULD simply be Mental Changes from B12 Deficiency!! But even when doctors cause these problems by giving drugs that deplete B12, they still refuse to test for B12 Deficiency or the High Homocysteine Levels that are a sign of Vitamin B12 Deficiency. Why Does This Go Undiagnosed? The Vitamin B12 Facts show that there are few doctors that routinely test for Vitamin B12 deficiency in their patients with these Vitamin B 12 Deficiency Symptoms! It SHOULD be routine for ANY patient with these symptoms to be tested; psychiatrists, gerontologists (specializing the diseases of the elderly) and neurologists should particularly be expected to be looking out for the best interests of people with these serious disorders. Unfortunately, the Standard of Care for doctors is to ONLY look for vitamin B12 deficiency when there is a condition called Macrocytic Anemia apparent in a routine blood test. But the above article (and others) state that up to ONE-QUARTER of people with these symptoms do NOT HAVE Macrocytic Anemia- or ANY abnormal blood tests for that matter. 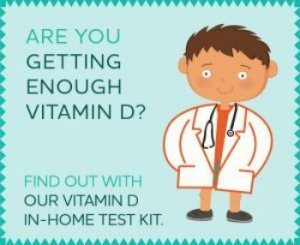 So, when the doctor does routine blood tests and states that ‘everything is fine’, that statement is meaningless when it comes to vitamin B12 deficiency symptoms. If you have any of these mental changes from B12 deficiency or you have a loved one with any of these symptoms, are you angry yet? Before consigning someone to a lifelong disease with no cure, don’t you think that these people DESERVE to have a simple vitamin deficiency ‘ruled out’? It is also important that these Mental Changes of B12 Deficiency be properly diagnosed early as well, because if they are left untreated- even for as short a time as a year- these mental changes from B12 deficiency can become completely permanent leading to unnecessary lifelong disability. If you or a loved one has any of these diagnoses or mental changes from B12 deficiency, you should insist upon getting a Methylmalonic Acid Test Methylmalonic Acid Test, or a check for MTHFR Gene Mutation, a common cause of Vitamin B12 Deficiency. What are proper levels of vitamin B12 for a 63 yr. old women? Is B-12 Deficiency a permanent situation?